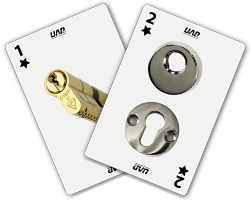 The UAP High Security 2* Kitemarked Escutcheon comes in 3 finishes – PVD Gold, Mirror Polished and Satin Stainless Steel, and has been designed to colour match with the UAP door knob in order to give perfect co-ordination to a front door. 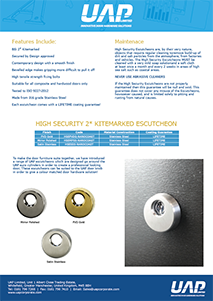 The high security escutcheon has several security features including a bevelled edge. The bevelled edge makes it a lot more difficult to grip the escutcheon with pliers in order to pull it off. 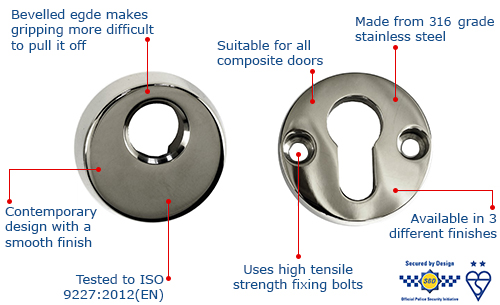 Another security feature are the high tensile strength fixing bolts, which secures to the escutcheon to the door. Each high security Kitemarked escutcheon is made from 316 grade stainless steel, and is part of the UAP Nanocoast range. The UAP Nanocoast range of products are specifically designed for areas which are within a 25 mile radius of the coast, or within 5 miles of highly populated industrial areas. Each straight pull handle has been salt spray tested to ASTM B117 for 2,000 hours, and comes with an industry first LIFETIME coating guarantee, as the escutcheon will not pit, rust or corrode no matter what environments you put them in!